Sometimes it feels like all I do is ride my bike down Royal Parade. This leafy portal to anywhere even slightly South or East of me has been a constant ever since my life stopped revolving around High School in Northcote all those years ago. Eeep, it is getting close-ish to a decade now; if riding down Royal Parade was a job, I’d be getting due for some long service leave. I should stop quantifying things in terms of how close to earning long service leave I am in them, it’s not particularly useful especially as I have been in my actual job now for only 9 weeks. This particular outing down Royal Parade to North Melbourne was to be my last in the hustle of Melbourne’s breakfast scene until the end of May, as I am about to be whisked away to Horsham for work. I am excited for some more rural breakfast experiences, perhaps I’ll try and stop in at some towns along the way to eat muesli and turn a 3.5 hour journey into a full day. Worth it? Who am I kidding I’ll probably just end up stopping in somewhere like Beufort for a vanilla slice and a Big M – much more sensible travelling fare. I arrived at Elceed, an airy cafe just west of Curzon street on Queensberry, and was surprised to be able to walk right in (sit right down) at 10am on a Sunday. I had visions of brunch lines snaking up the road, and having that conversation with my companions that happens when one person (me) is trying to test the waters and see how committed the company is to having brunch at all. Wouldn’t it be nicer if we didn’t have to wait because we all just gave up? Hmmm, perhaps I catastrophise slightly, I just don’t like waiting for breakfast on top of that waiting time necessitated by the concept of brunch. I digress. Elceed was not made to honour the image of the homophonous Alcide, but still managed to be a nice place to eat by virtue of light, textured walls, open archways and large terrariums. Everything is so upright! 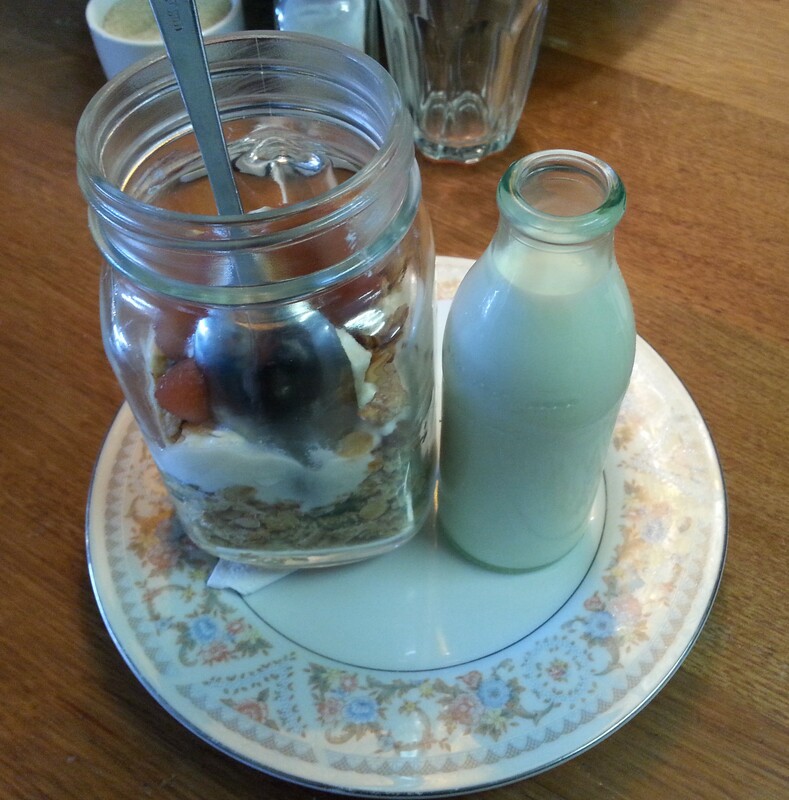 I think I was in shock, and hence could not work out how to photograph this spooned-jar of muesli. Was the spoon placed in the jar just so I would be instantly presented with evidence that it would fit; that yes, it would be possible to get my breakfast out of there using that? I still felt a bit like a bear at the zoo trying desperately to solve a food-puzzle. The reward did have a honey component, which made my bear-self happy but was a trifle overpowering to start with. True to its pronunciation, the Elceed granola contained plenty of seeds. Pumpkin seeds were the stars of the show, which created a nice nutritious crunch alongside the toasty oats and flecks of coconut. Cranberries were a thoughtful, red, chewy addition and I think were also used to poach the slices of ?apple (I’ll be honest, I settled on it being a plum before I re-read the menu…please continue to trust my food reviews) if the grammar of the menu was to be believed. Whatever happened to make that fruit how it was when I consumed it, it was tasty. Final word: The Elceed granola is a bit of a puzzle in terms of the logistics of eating it, and identification of its components. Do try this granola if you have already had a first breakfast and just like the taste of toasted oats and seeds (guilty!). If you are very hungry and insist on granola, Elceed have cakes that looked perfectly suitable for a cheeky dessert portion of your morning meal. Yes, the title of this post is a warning to any Victorian-era time-travellers or fetishists out there looking for a pipe – Hot Poppy is not a den of ill repute. Rather, it is an earthy cafe on the corner of Errol and Victoria Streets in North Melbourne. Unfortunately I cannot give very much of a comment on the interior of this place as my co-conspirator that warm morning was already seated outside when I arrived. I do have a lingering sense of thick, good-quality timber as the material making up the Hot Poppy facade but you can take that with the grain of wheat it deserves (this is a muesli blog, salt has no place here). I did, however, have my first documentable out-door breakfast – a sensory smorgasbord. I experienced the feeling of the wind caressing my still-damp hair and kissing my rosy cheeks, still warm from the exertion of the ride up the Errol street hill; the sight of Miss Chic Pea illuminated in the untempered sunlight; the smell of fresh morning rain and finally, the ungodly screeching of the 57 tram as it turns along Victoria Street. My ears are still ringing (but that could be pathological). This is a clearly striking muesli. There is nothing like a bit of visual contrast to excite the tastebuds, and those guys were not disappointed. Contrary to the bold strawberry statement, citrus was the flavour of the day coming across through the orange rind scattered throughout the dish. 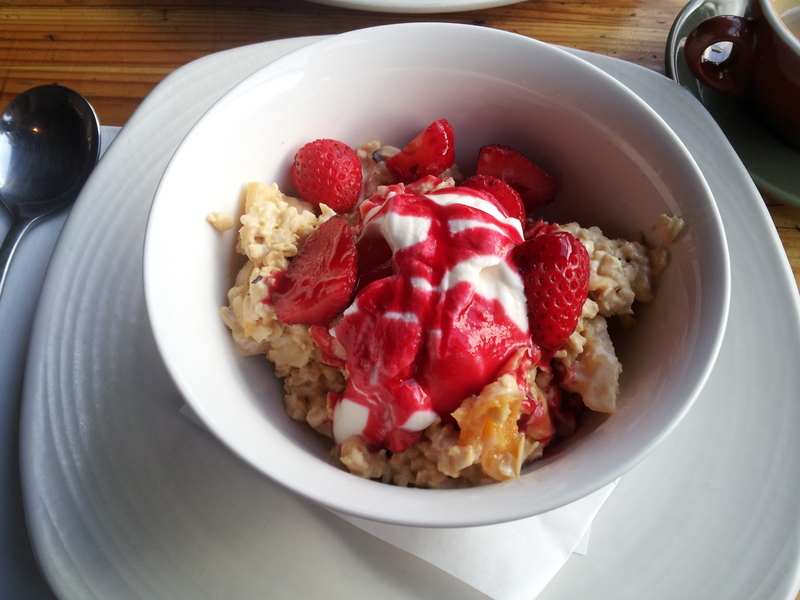 It was a refreshing difference to the creamy muesli I have endured of late. The Hot Poppy muesli is a dense one, and I would have appreciated a bit of milk to loosen things up. It would have gone nicely with the hazelnuts that, to my delight, made an appearance as the nut of choice in this cereal. Another interesting feature of this muesli was the use of large chunks of dried apple rings, seemingly in place of the standard bircher grated apple. I loved it, not just because the leathery texture is a great thing, but also because I am of the opinion “why have a sliver when you can have a chunk?”. It’s how I live my life. So I was happily munching my way through breakfast, nattering away safe in the knowledge that I was back on the positive review bandwagon when I was suddenly arrested mid-chew. I had crunched down on something hard. I can only equate it to the feeling you get when you have dropped something tasty and hence precious on the ground, made the decision to ignore what just happened and continue eating, only to then be reminded of your transgression over hygiene by the sensation of chewing on floor-grit. I was initially scared that I was eating my own tooth. I wasn’t. Could it have been a bit of glass? Was it a stone flicked over from the wailing number 57 tram? Was it someone else’s tooth? I will never know because I swallowed it. And as what occurs with guilty floor-food, I continued to eat this muesli because it was delicious. Final Word: By all means order the muesli at Hot Poppy if you are cereal minded and can ignore my last paragraph. Sit indoors for the sake of your eardrums.